NOAA (top) vs. reality below. Colorado warmer than average? Really? Weather underground has the straight scoop unbiased as always complete with giant red world map. Unfortunately for them, we have something known as actual temperature records. 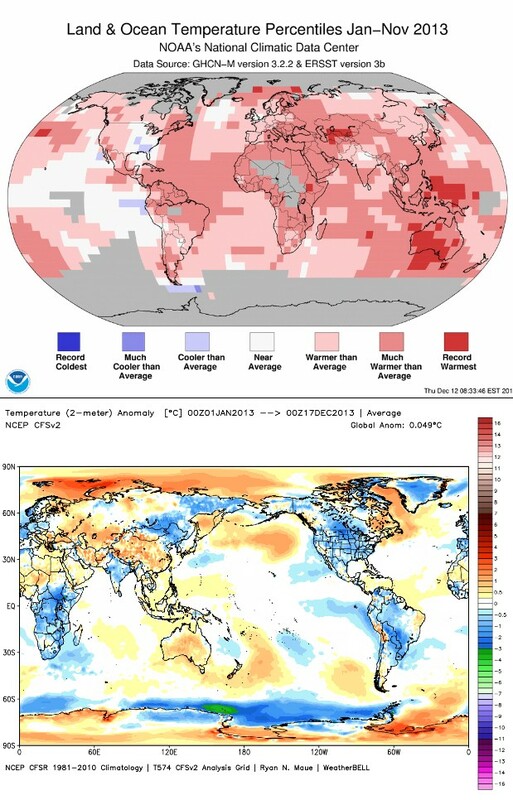 The actual temperatures say that most of the US has been below normal, not average to above. NOAA is ;pathetic. Record hot year in Australia? NOAA clowns at it again. Jeff Masters at wunderclown is spewing the lies as well. Cold December in US means time to pump the propaganda. Holy crapola, there must be large sums of money at stake with these kinds of fraudulent and downright deceptive tactics. The worthless pieces of sheet are nearing their end, and that is of course the scary part! That chart is for November 2013. The one at the top of the page is for January to November. Also the chart at the top of the page is percentiles. Now that is amazing. In this day and age, NOAA has no data just east of Northern Japan, no data just SW of Alaska, no data for most of Hudson Bay? NOAA : Naturally, outrageous adjustments abound. “The recent MJO wave [Jan/2013] released a historically large amount of latent heat from the tropical oceans. It stagnated for 10 days in its most convectively active mode, at high amplitude, until the walker cell caved. [in December] .. it was clear the SSW event would ignite the MJO. and the temps really dropped in February and continued to fall at the same rate as since mid 2012.
try http://www.woodfortrees.org/plot/rss/from:2008/to:2014/plot/rss/from:2008/to:2014/trend – notice the difference? and the graph I showed is in connection with this statement. Any period of strong El Nino+La Nina distorts the linear trend dramatically, but locally. It does not necessarily mean that the trend disappeared or changed. If you follow the trend since 2001, you’ll see that it is positive with some oscillation only until 2006. After 2007, inclusive, it becomes negative, with the only exception of the 2001-2010 period, which was almost exactly flat (no trend). The trend after 2010 is stable and negative, whether you like it or not. In fact, if the climate was warming the trend after 2010 should be positive, because the two La Ninas of 2010 and 2011 would only have decreased a little the rate of warmth without changing it, and this would be observed in the measurements of the following years, in 2012 and 2013.
the trend after 2010 is even more pronounced than in the 2001-2013 period, showing in fact that the cooling is accelerating. Are we witnessing another change of tactic here? Instead of unprecedented rates of warming now the metric is how long the positive anomaly has been hanging around? With geologic time scales being the standard of measure this should be a good strategy for another decade or so as damage control. But its hardly going to get anybody excited about CAGW.